Lock in a great price for Camplus Guest Bononia Casa per Ferie – rated 8.6 by recent guests! Very new and super clean structure, close enough to both city center and exhibition site. - Very well equipped room. The room is sooo comfortable. You can find everything you want here. - Good service. We arrived at 9 pm before Christmas Eve. There’s still responsible person at the reception. - Superrrrrr goood breakfast. You have a lot of choices for breakfast and it tasted so good. Near the Bologna fair I was visiting. Good connectivity. 20 minute walk from city center. Fast wireless. Good and available parking. close to two train stations, one was 5 mins walk, other was 8 mins walk. both served by trains from Bologna Central. good generous breakfast. Nice terrace / restaurant in the area - 10 minute walk away, room was pretty clean except the experience with the beds...maybe we had the unluck to have a bad room. Good wifi signal. Super kind staff, especially Matias from the front desk. Thanks Matias! The hotel is modern, the rooms are comfortable, super clean and quiet. Easy access to city centre (20 minutes pleasant walk). Good ans varied breakfast and wi-fi connection. Will definitely come back here if we'll visit Bologna once again. The room was excellent, it came with one double sized bed (no crack to fall into while sleeping, yay!) and the bathroom was clean and spacious. Hotel staff was kind and helpful with any questions we had. The breakfast was good, it had the essentials. The center is about a 15 to 20 minute walk, which was doable for us, so we never took the bus or train. There was enough free parking. 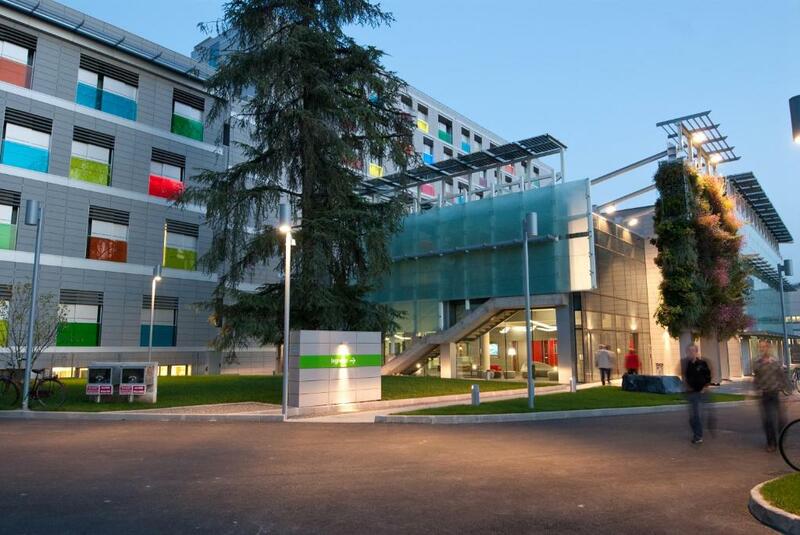 One of our top picks in Bologna.Set a 15-minute walk from the famous University of Bologna area, Camplus Guest Bononia features free WiFi throughout, free on-site parking, and a 24-hour gym. All rooms are air conditioned and feature a flat-screen TV and an private bathroom with free toiletries. They have allergy-free linen. Breakfast is sweet and savory and served in a buffet style. It includes croissants, eggs and bacon, and fruit juices. The self-service restaurant specializes in local and classic Italian dishes. A bus to/from Bologna's historic center stops 1,650 feet away, while BolognaFiere Exhibition Center can be reached in 20 minutes on foot. The train station is 1.6 mi away. 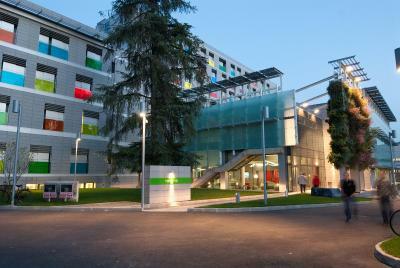 The property is inside the Villaggio del Fanciullo sports center, which features an indoor swimming pool open all year. It also includes a business center. When would you like to stay at Camplus Guest Bononia Casa per Ferie? Air-conditioned room with a flat-screen TV and private bathroom with free toiletries. Wi-Fi is free. Larger, air-conditioned room with a flat-screen TV and private bathroom with free toiletries. Wi-Fi is free. House Rules Camplus Guest Bononia Casa per Ferie takes special requests – add in the next step! ATM card Camplus Guest Bononia Casa per Ferie accepts these cards and reserves the right to temporarily hold an amount prior to arrival. Camplus Guest Bononia Casa per Ferie accepts these cards and reserves the right to temporarily hold an amount prior to arrival. Please note that the restaurant is closed on Sunday. When booking more than 5 rooms, please note that different conditions may apply. At the check-out was not possible to issue the invoice because it was a pre-payment, so it I had to ask in advance for the invoice at the time of booking. Breakfast was amazing!!!!!! The rooms were clean and spacious! The staff was very helpful and inviting. Very nice breakfast, friendly staff, very nice and cozy room. Everything was excellent. We had an amazing time. Thank you! Not very clean room-under the bed there was much dust.we could not play ping pong while it was mentioned at hotels facilities when we booked it. The room was too hot and the temperature control didn't work. My mobile phone would not charge when I was out of the room because I had to take my key card with me in order to get back in. The layout and decor and the choice of food and beverages The cleanliness was also impressive. Far from the center, 10 minute walk to the bus stop. Breakfast was very good, but it was very Italian, in the sense that there were lots of sweet things to eat and very few non-sweet things. The cooked items were good and something we didn't expect to have, so that was a nice surprise. Fruit salad was available at breakfast, but you couldn't have a piece of whole fruit [e.g. a banana or an apple]. I'd have liked to have a wider range of savoury breakfast products [e.g. more types of cheese]. One more thing that we weren't happy about at all was that a couple of mornings and evenings/ nights there was a lot of noise in the hotel corridor coming from the young students that lived near our room. Very clean room and hotel premises and extremely helpful and polite staff. Easy access to value-for-money and good quality food and refreshments as there is a restaurant at the hotel and a lot of self-service snack machines. Hotel location is very good. The area is quiet and there's a direct train line to the centre of Bologna. The train station Bologna San Vitale is a 5-minute walk from the hotel and within 4 minutes you can reach Bologna.